Bad Decision Tuesday: Who Are These Men And Why Are They Hugging Me? I just wrote half an entry about how wedding planning is haaaaaaaaaard, no-one ever told me it would be haaaaaaaaard, why is it so haaaaaaaard, but then it made me want to kick myself in the teeth and punch myself in the clavicle and karate chop myself in the pancreas, and so I deleted it instead. And then I thought "well, what am I going to post about now?" And then I remembered. What did I remember? Well, I remembered that I have something to show you. I found this something a few months ago at my parents' new house in San Diego, you see, when my sister and I were going through the drawers of my old desk, a desk whose drawers definitely hadn't been gone through since at least 1999. In these drawers, I found an old stack of photographs. And amongst this old stack of photographs, I found gold, pure comedy gold. Internet, I think you will find it nothing less. Here is me, aged approximately ten, I would say, wearing a pair of stonewashed jean shorts and a midriff-baring top---along with my dinner plate-sized spectacles, of course, all the better to look sophisticated and alluring, n'est-ce-pas?---in the clutches of a swarthy Frenchman three times my age at a Club Med Resort in Malaysia circa 1990. I know, it's like a bad acid trip, right? OH, BUT THERE'S MORE. 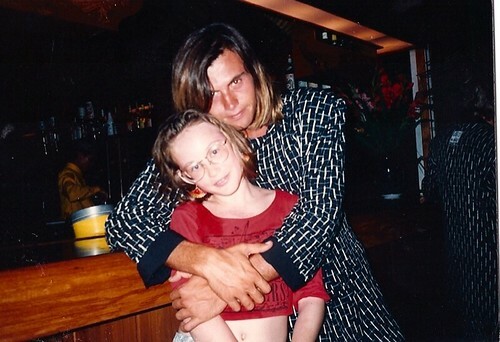 Here is me, aged approximately ten, wearing a pair of stonewashed jean shorts and a midriff-baring top, along with my dinner plate-sized spectacles, in the clutches of a swarthy German man three times my age at a Club Med Resort in Malaysia circa 1990. 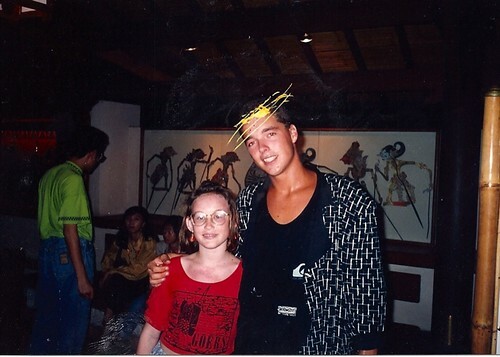 And here is me, aged approximately ten, wearing a pair of stonewashed jean shorts and a midriff-baring top, along with my dinner plate-sized spectacles, in the clutches of a swarthy Australian man three times my age---well, alright, maybe this one's only twice my age---at a Club Med Resort in Malaysia circa 1990. I don't remember why the Australian's head is scribbled over in yellow like that, but I do remember that his name was Justin. Hi, Justin! Remember me? What a cute, sweaty, eighties-looking couple we make! Too bad it WASN'T ACTUALLY THE EIGHTIES ANYMORE, EH? When I showed these pictures to Sean just now, he stared at them bemusedly for a few seconds and then said "there was nothing.....untoward going on here, right?" Because yes darling, as an awkward ten-year-old, I would frequently pick up international men in bars at night, luring them in with my unparalleled beauty and my dangly fan-shaped earrings and THOSE GLASSES, OH THOSE GLASSES, DON'T YOU JUST WANT TO RIP THEM OFF MY FACE AND STAMP ON THEM. As you can see, aged ten, I was a stone-cold fox. No, those dudes were Club Med employees---leaders of the Kids' Club, if I remember rightly---and we'd just finished doing a show together. Are you familiar with Club Med and its nightly shows? As children, we thought they were the bees' knees, these shows: every evening, the entire staff would dress up and do hilarious skits and sketches for an hour, and at the end there was always a massive singalong, during which the entire audience would rise to its feet and sing along to a medley of songs, one of which included the lyrics "boom, boom, boom, let's go back to my room. "* One night a week, the Kids' Club put on the show, and this was always a highly charged event, full of hours worth of practicing and fretting about costumes. One year---in fact, I believe it was this year (uh, by which I mean the year the above photos were taken, not, you know, THIS year)---my role in the show was to lip-sync along to Kylie Minogue while sporting a sequined miniskirt and crimped hair. Ah, my fifteen minutes of fame. *HOLY MOTHER OF ABRAHAM LINCOLN, I FOUND THE VIDEO OF IT! It's filthy! Why were they letting children sing along to this?! Did anyone else ever go to Club Med, by the way, when they were younger? As a child, they were the most wonderful and also the most bizarre vacations. And yet, if the pictures above are anything to go by, apparently not lacking in relatively attractive---if a little creepy---French and German and Australian men, and relatively undiscerning ones at that (again: did you see those glasses?) Hmm, maybe if this wedding thing doesn't work out, I should go back. Hold me ... I'm scared. OMFG, I totally remember that song too! I must have officially crossed the threshold into land of Old Man Jenkins and ladies wandering around the neighborhood wearing bathrobes and curlers, but I now wonder why on earth my mom was not at all concerned that I was walking around singing songs like this. At least when I was running around singing Like a Virgin, she probably assumed (correctly) that I had NO IDEA what I was saying. Shiny and new, indeed. At first I was kind of weirded out that everyone in those pictures had on the same jacket, but I'm hoping that these were uniforms, not some weird Malaysian trend that everyone was wearing, like Hypercolor shirts. I had equally huge glasses that were improved only by their fashionable pink tint. I also had (well, still have) stick straight hair, so my huge pink thick as Coke bottle bottoms glasses were accompanied by bangs that were permed. Not my entire head of hair mind you, JUST MY BANGS. Apparently I was doing something wrong because my foxy self was not attracting the hot international set. Obviously I should have been taking lessons from you! Is the yellow scribble possibly a result of that cool middle school trick of wetting the photo paper and then scraping at it with a pin? Yes, please tell us what is going on with those jackets! The woman in the second photo (looking on bemusedly and eyeing up the ten year old little boy who is perhaps bringing her a beer) is wearing the same one with matching pants! The pictures are HILARIOUS! Reminds me of a few snaps taken during a family trip to San Diego, in which we went to Tijuana for a day and I proceeded to have pictures taken with some of the shop keepers (who were men in their 20's). I was in a tie-dye shirt in the photos, which is just as fashion-forward as acid wash shorts! My glasses were the same size EXCEPT mine had an awesome purple gradient tint on them. That's some serious hotness right there. oh boy do I have stories about Club Med! Cancun, Punta Cana, remember the picnics? one word: Lethal... Thanks for helping me remember that past! I have asked my Mom time and again why she would let me choose the hideous dinner plate glasses... she says I looked "cute." I assure you, I did not look cute. I looked like an idiot... but I'm glad to know I was in good company! I should be really ashamed that I am singing ALL of the words to that song, but no, this has mad my day. My sad, sad little day. In other news I thought the first picture was of a man wearing a very ill-fitting dress. Just look at those sleeves! But then I was delighted with two more men wearing the same thing. And a lady in the background! I am guessing they were robes for the employees? Or something? It would have been a fraction less terrifying if the Frenchman hadn't looked so...Frenchly seductive. I mean, did he have to make that face while hugging a 10-year-old? At first, I totally thought you met Fabio...but, alas, that was not the case. Although, if guys that look like the Australian still work at Club Med resorts, I think I've found my next vacation destination! That video IS filthy! What were they thinking...Ok, so if I know Club Med, they were thinking that the parents would be too drunk to notice anyway. Anyway... I gave you an award! Hope you'll play along. Oh my god, that video!!! I need to go to You Tube now and watch a bunch of kitten videos to get the taste of GROSS out of my mouth. Also I think we were twinsies when we were ten, but I'm not brave enough to post photos, like you. Bravo. We stayed in Club Med a few years ago. The kids LOVED it and my husband and I HATED it and yes those cap letters are necessary. Never again! I guess I just wasn't drunk enough. Cut-off T's were all the rage, heck they probably still are in some places. I think the lady in the matching jacket in the second picture is creepy- what is she looking at? As for the song, No. Just No. I didn't go to Club Med, but for my high school graduation, my mom took me on an all-inclusive trip to Margarita Island, off the coast of Venezuela. They didn't have a Kid's Club, but they had the same kind of activity directors, and I have photo after inappropriate photo of me posing with these swarthy international men. Granted, I was not 10 at the time but almost of legal age, but I can't even look at the photos now without feeling a little bit dirty. As a ten year old, I would have been thrilled at the sight of these photos. As the MOTHER of a ten year old, I am wondering how well Club Med vetted their Kid's Club employees... those first two guys look as if they could have been in Malaysia avoiding international extradition on any number of unmentionable crimes (shudder). Pure nugget of nostalgic gold! I (shamelessly) watched that entire video. Favorite line? "To be or not to be- don't you know I'd like a bite?" Looks like I've got a new pick up line! This is highly, highly disturbing. What is the LOOK that first guy is giving the camera? And the way they're GRIPPING you, all weirdly possessive. I...I don't really know where to go with this. I also was certain that the German guy was Fabio, and I was a little miffed that you hadn't mentioned your Fabio encounter before. I am so glad you are all enjoying this as much as I did when I rediscovered these photos! WHO ARE THESE CREEPY MEN? WHY ARE THEY CUDDLING A TEN YEAR OLD? Also, the jackets! I know! I can only think that it must have been some kind of Club Med uniform. Moreover, the woman in the second photo (who appears to be waiting for the 10-year-old boy to bring her a beer -- good one DiaryofWhy!) seems also to be wearing PANTS made of the same material! For once, I am not the one in the photograph committing the biggest fashion faux pas! I had never heard of that song, but I just watched the video. That is disturbing that you guys sang that as KIDS. And while I was thinking how disturbing that was, my daughter started kicking. Repeatedly. And I think that was even MORE creepy, feeling my daughter shake her booty to this song from within the womb. That is NOT OKAY. I think she's going to be grounded as soon as she's born. Yes! I was at Club Med Eluthera when I was nine. We did a circus performance. I had to wear a sparkling purple leotard, and I believe I was in the bicycle performance? I have vague memory of us all stacking up somehow on a moving bike. I also had dinner plate-sized glasses at the time. I swear on my life I've been to a Club Med and I have distinct memories of being hugged by a much older gentleman. I think it's the same guy...ewwww. Also, in several photos I appear to be wearing a similiar bathing suit to the one the Borat wears. What the hell was wrong with my parents?? And for some reason I decided it would be fun to do the circus and be twirled around at high speeds on what amounted to a very thick rope. These photos brought back so many memories for me! I went on several similar holidays to Spain and can fondly recall the Thomson Kids Club and various others, where we did activities such as "dig the biggest hole in the sand" competitions and lizard watching in our club-issued t-shirts. I think I still have a certificate somewhere for winning one of their competitions. I also remember doing several shows, including one where we recreated the musical Cats - in pale blue bodysuits with feather boas and cat ears - and a Little Miss Ibiza competition where I strutted my stuff to Ace of Base (ah, the 90s). It's amazing what parents will let their offspring get up to so they relax by the pool with a book! Ohhhhh boy. I had glasses like that, too. In the late 1970s. When I was in elementary school. Dreadful. I think I actually still have the frames kicking around here somewhere, for what reason I do not know. My mother also gave me the worst haircut, which, combined with those glasses, made me look like I should be on the short bus. To this day, she thinks I looked adorable. This post acts as a stark reminder to NEVER go to ClubMed. Ever. There's nothing wrong with Club Med! I love Club Med! I'd go back there in an instant. I just wouldn't wear that outfit. My first thought was, 'are these men wearing DRESSES?!' I thought it was some sort of weird group of cross-dressers who had caught your ten-year-old self in their clutches. Also, I think we looked exactly alike at aged 10. I didn't have the spectacles but as far as fair skin, freckles and general ungainliness? We were a match! wow those pictures are priceless! my favorite part of this post is sean saying "there wasn't anything...UNTOWARD going on?" hehe the use of the word untoward made me smile! he sounds like mr. darcy! Well, I've got you beat. MY glasses were huge AND they were shaded brown on the top half of each lens! AND I had braces! AND I wore stretch plaid bellbottoms! By the way, the second guy? Totally hot - you should have gone for it big time. That is hilarious and quite a bit creepy. None of these men look like they should be entrusted with the care or entertaining of children...In any way! Ever! First off the men ARE beautiful... Creepy but beautiful. I agree..perhaps not the best song choice for teens and preteens to be gyrating to. I'm glad I'm not the only one who was like "Wait, is that your brother bringing beer to your mom in the second picture??" And how much more does Sean need? You were a stone cold fox and those men couldn't keep their hands off you. I'm so jealous of your ten year old hotness. Although, here's the good news in all of this - you're ridiculously gorgeous and beautifully dressed now. It makes me feel better to know you had your own special awkward stage. That is hilarious. Holly - do you remember I was Ferris Bueller and had to lip sync to "Now that I Can Dance"? What a s stud...! No, never went to Club Med. But I want to now! I so thought that was Fabio in the first photo. they were all the rage, heck they probably still are in some places. I think the lady in the matching jacket i really liked the pose. I just found you, and I think you're hilarious. What's IS going on with the hugging, should the people who work with the kids learn the side by side one arm hug, like Justin? Those first two are totally innapropriate and disturbing, but makes for a great post! Glad I've finally found soehnmitg I agree with!